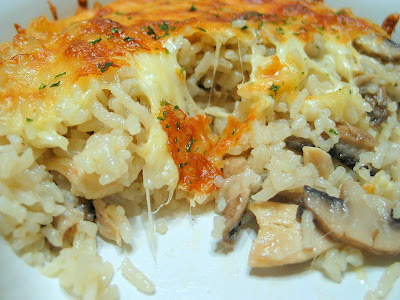 I have tried making baked rice dishes several times. When it comes to cooking dishes, I have a tendency not to follow the recipes closely. Somehow, I do not have the habit of measuring the ingredients, I simply estimate the amount needed. As a result, sometimes the rice will be too dry, sometimes the combination just didn't seems to be right...most of the time it turned out to be too bland or not creamy enough. This time round, I still didn't follow the recipe exactly, but at least, I took the effort to measure the amount of cream, and the amount of chicken stock required. This actually paid off. The rice was not dry at all and it was creamy enough, though I should have added more black pepper. Wash and cook rice with rice cooker. Bring a pot of water to the boil, put in the chicken thigh and boil till the chicken is almost cooked. Let cool and shred the chicken into bite sizes. Reserve half cup of the chicken stock. Heat up a deep pan, with some cooking oil (or butter) stir fry minced garlic and mushrooms. Add in the shredded chicken meat. Add pepper and salt to taste. Continute to stir fry till the mushrooms become soft. Add in the cooked rice. Stir and let it cook for a few mins or until the sauce is almost fully absorbed by the rice. Place rice into a heatproof baking dish. Cover top with grated cheese. Bake in a pre-heated oven at 200 degC, till the cheese turns golden brown. Sprinkle with some dried parsley. Serve immediately. This is really yummy! I think I like it as much as your kid. 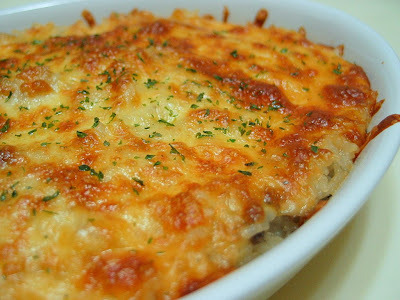 Your baked rice looks tempting! May I know what is dairy cream? or what brand you're using. Wud like to try it out. Such a simple meal is a breeze to make.. I have to crack my head EVERYDAY what to cook for my family :( Thanks for sharing your recipes. Me too, I always have to crack my head what to cook for my family!! By the way, ur plum cake looks good. Doesn't seem to be as what u described. Probably it really needs a bit of chilling to bring out the flavour. Wow! I've always love baked rice from Swensons. Now with your recipe, I can finally try it out. Just 2 questions. Where can I buy the heatproof baking dish? Also, if I don't have diary cream can I use the non diary type? The same one for frosting cakes? I've got leftover in the freezer. We are a nation of rice lovers and I'm bookmarking this recipe right now! It looks delicious, sweetie! Hi Serena, sorry, I missed out your other question! I got the ovenproof baking dish from Ikea, it comes in a set of 2 (one oval and one rectangle), cost $7.90 a set. which type of cream do u buy for tis baked rice? can we don put the cream? Hi Cindy, I got the dairy whipping cream from Phoon Huat, the brand is Millac, which comes in a blue packaging in 1 ltr. If you omit the cream, the baked rice will not be creamy. On the other hand, you can also use canned soup instead to replace the chicken stock and cream. The taste will be less creamy. Hope this helps! btw UHT whipping cream is for cake? can use for tis? i think cannot ba righT? how bout the brand nestle de. small can one? blue white packaging. hihi.. ur baked rice look real yummy. Can i ask what type of rice did you use? Calrose or the normal Thai rice? hello! your baked rice look AWESOME! im trying to make baked rice too, for my godsis. but the things is, she's allergied to dairy products and meat. >.< so i can't use milk, butter, egg, cream and chicken/chicken stock. Hi Mai, you can use a can of mushroom soup to replace the cream and stock. I am not sure whether the combination of fish with mushroom will be nice?? but you can try using salmon...but since she's allergied to dairy products, this dish may not be a good choice?? First of all, thanks for sharing ur recipe. Hi Shuying, hmmm, I guess maybe you will have to adjust the amount of salt accordingly. The other thing is the chicken stock and the dairy cream. I used dairy whipping cream either from Phoon Huat, or this brand Bulla (heavy cream) from supermarts. It gives a very rich creamy taste to the dish. Hope this helps. It looks very tempting. Btw, how long you took to make the baked rice ? Are you refering to the baking time? As my oven is on the 'cool' side, it took about 10-15mins before the cheese turned golden brown. The baking time would really depend on your oven. 1) Can the chicken be replaced by salmon fish? 2) Is chicken stock really necessary? If not, what can i replace it with? Butter? Oh and, how long overall did it take you to do? Plus the baking times and all, i only got an hour! Haha. How long is the duration of the whole thing? Hi. I bought BULLA Thickened cream, is that alright? I'll be cooking it tonight for dinner, so I want to make sure it's right. And Is it Halal? I think I took slightly more than an hour, as I need to boil the chicken. I am not sure whether you can complete it within one hour...so, maybe u want to do a 'test run' at home to see how it goes?? Hi Anonymous, yes, I use Bulla thickened cream. However, I have no idea whether it is Halal, sorry I'm of not much help. sorry im disturbing, but for my case i am going to fry the salmon at home , since my home economics is during the first period. Do you think I will have time to complete it? I can't say for sure you can complete it on time, especially since it is the first time your are trying to cook this dish. It is advisable to try it out at home before your actual test. Was wondering if I were to replace the cream and stock w the campbell cream of mushroom, is that fine? Or do I use cream of chicken mushroom? Oh and, do I use the whole can? For the rice, I just have to cook it as per normal right? Hi, I think you can replace it with campbell soup, although I have not tried it. As for the amount, you wil have to adjust it, maybe you can use 1.5 cups (after you have mixed 1 can of soup with 1 can of water). As for the favour, I personally prefer cream of mushroom. Yes, the rice is cooked as per normal. Hope this helps. Tried your baked rice recipe today, but because i used 2cups of rice instead of 1 1/2cups. But it still taste very good, except its a little on the dry side. Will surely cook this very often. Fast and easy and simple dish. Thanks for sharing the recipe. hey, I stumbled upon your blog whilst searching for recipes on how to make chicken baked rice. I thought it's super cool that you would go to the trouble to write up recipes as well as take pictures of your home-cooked fare to share w/ everyone. am totally gonna try your recipe out. 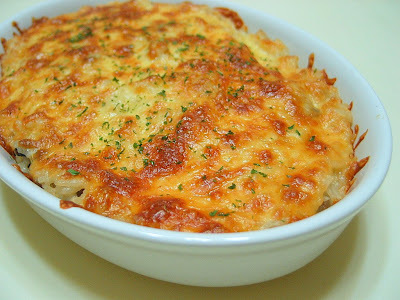 Hi , urms i wanna try making this baked rice tomorrow for lunch but...i have some ingredient i do not have and about the Dairy Cream 1 Cup..What " CUP " do you actually use i mean..i have alot of cups and it come in different sizes and shapes and i'm not sure exactly the amount of cream i should put @@ . Hi Tasmin, one 'cup' refers to the standard measuring cup, not any other cup ;) One cup is also equivalent to 250ml. You dont have to follow the exact ingredient list...but you must have the grated mozzarella cheese and the dairy cream. Do take note that you Must add the cream before the chicken stock. Hope this helps, and I hope you will like this recipe. Can I use the normal slice cheese? Its cheaper. Hi Anonymous, I'm afraid normal slice cheese will not give the same taste and texture as mozzarella cheese. Hi! Thanks for helping me HappyHomeBaker.I tried making it and it was delicious!I added more BULLA thicken cream and the rice taste kinda nice not so dry.Urm do you mind adding me on the mail because my friend's birthday i coming soon and i would like to bake a cake and i have never done it before so i'm quite nervous because ingredients can be expensive @@ and i don't want to make a mistake and have to buy again.><..my email is freakharts@hotmail.com ^^ thanks! 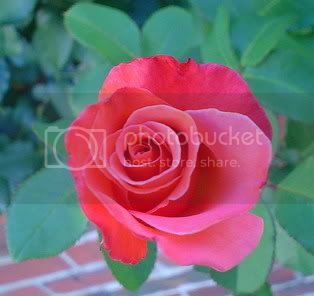 baking911.com provides very detailed information on baking, I am sure after reading thru the site you will get a better understanding on baking. You can also pick up baking books from the library...I learn my baking from reading cookbooks...so far I have not attended any workshops or courses. If you can read Chinese? you can borrow Chinese baking books as most of them got lots of step by step photos to illustrate. You can always start from the very basics bakes...I started baking with brownies, cookies and muffins. They are easier for beginners..and I waited for quite some time before I was comfortable enough to make a sponge cake! If you have any questions pertaining to any specific recipe that I have posted, feel free to leave a comment on that posting. I will try my best to answer them. Hi June, you can get a cheaper brand (no brand actually!) from cold storage. It is about $2.90 which comes in a small pack, 150g if I remember it correctly. Hi. Like to ask u few qns. 1. how much is 1/2 cup of stock? i using the chicken brand stock, is it 1/2 cube? and if i use cube, 1/2 cup of water will be fine? 2. If im using the can, cream of mushroom, capbell kind, do i need to add water? I wanted to say thank you for this interesting recipe which i followed and everyone at home love it. so tdy i prepared this dish for the second time and changed the ingredients to seafood and i also post the recipe to my blog, which i hope you won't mind about it. Hello Homebaker, you have so many interesting recipes i have been visiting your blog DAILY! Wana try this baked rice, wondering if using the water used to cook chicken, its enough to make a chicken stock for this recipe? No need to add any other ingredients? Wont it be too bland? Kindly enlighten cuz there is no way to correct a bland baked rice...thanks in advance! Hi Anonymous, I am sorry to hear that this baked rice didn't turn out well. I am not a good cook, so sorry for the disappointment. Thank you for this recipe. I made it for dinner tonight and it was delicious. This dish is available to order at our local restaurant and it is one of our favourite dishes. thanks for posting this nice, easy and most importantly most SATISFYING dish. it will be in regular rotation now! hey! i am doing baked rice for my pratical exam. i am wondering if is it possible that i use chicken breast instead of chicken thigh? and what kind of mushroom did you used? and, can i buy the dairy cream in fairprice? which brand is better? plus, can i not use chicken stock? thanks(: sorry if i asked too much. Hi, I am wondering do you have the measurements for just one serving ? :) also the chicken stock you meant is it the water after you cooked the chicken with ? :) thanks ! Hi Edwin, I don't have the measurements for just one serving. You can used store bought chicken stock, eg Swanson's chicken broth. Hi! I've done this twice now and at both times, they taste so delicious! Thank you for sharing your recipe! I hope you don't mind if I put your link in my blog! Btw, for those looking for a Halal cream, Bulla (an Australian brand) manufactures them using Halal gelatin. They can be found in NTUC. Hi ofpealsandroses, thanks for trying this recipe, glad to hear that you like it :):) I didn't know Bulla cream is Halal, thanks for sharing this info! We used your recipe and it turns out really good! A big thank you to you!!! Hi, as long as your oven microwave comes with a baking function, you can use it. How Long does it take to bake the cheese baked rice? How many minute? Hi, it takes about 10 to 15mins, as every oven works differently, do monitor after the first 10mins as the cheese will get burnt easily. hope this helps. I cooked this for dinner just now. So simple and so yummy. My little boy loves it and me too! I like the muisture stay in the rice, such a comfort food. Thanks for a nice recipe! Hi, may I know how much water did you use to boil the chicken thigh? Do you simmer the chicken thighs until they are almost cooked? Do you have an estimated time? If the water level is reduced during boiling, do I have to refill water to cover the chicken thigh again? Hi, use water that is enough to cover the chicken thigh, i boil until it is cooked, not more than 10mins. You can add in more water if necessary. Thanks for sharing the recipe. I tried it for the 1st time for dinner today and it turned out well. I used Nestlé dairy cream instead. Looking forward to more cooking!